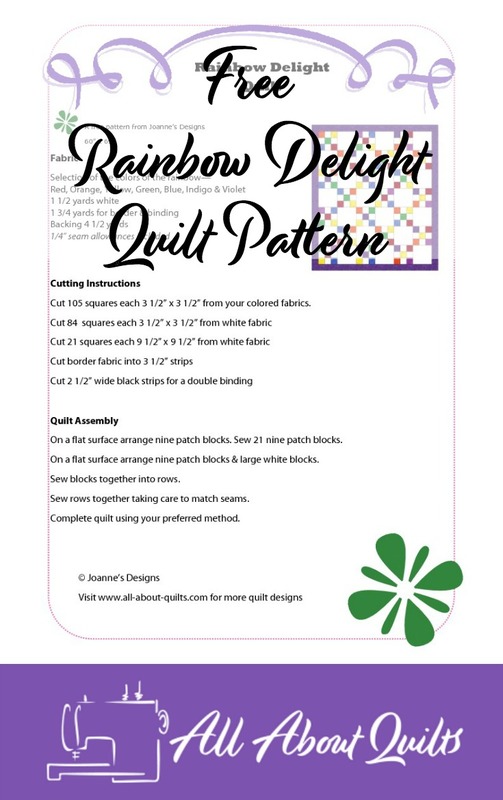 Rainbow Delight Quilt 60" x 69"
Joannes Designs Week29 'Rainbow Delight Quilt' a design I created after being inspired by a similar quilt. 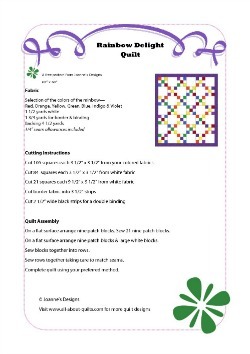 This quilt has been designed with the beginner quilter in mind. I designed a similar quilt on week 2 of this challenge for my niece's first baby. This quilt is made from 2 different sized squares. The small squares are cut 3 1/2" and the large squares are cut 9 1/2". 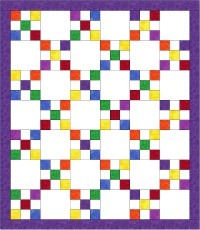 There are 42 blocks in this quilt - 21 are nine patch blocks and 21 are plain white blocks. This quilt is best made by cutting your fabrics into 3 1/2" strips. Then cut your strips into 3 1/2" squares. This is a very economical quilt to make with almost no fabric wastage! The white fabric needs to be cut into 2 different strip widths, one 3 1/2" wide and the other 9 1/2" wide. There is a 3 1/2" wide border around this quilt, as well as a binding in the same fabric. Choose contrasting fabrics. You need a total of eight fabrics for this quilt. I would buy a fat quarter of each coloured fabric and cut them all into squares (not the dark border & binding though - you will need approximately 1 5/8 yards), then play! When all your squares have been cut out, lay out your design on a flat surface - either a design wall, bed or floor. Spend time at this stage playing with your arrangment. You want to ensure you have a fairly even distribution of your fabrics. This quilt lends itself to using the strip piecing method and it would certainly speed up the time required to sew all the pieces together. I saw a stunning quilt in this design and have pinned it to my 'Nine Patch Quilts' board. It has a stunning swirling quilted design on the large white sqaures. To view this quilt click on the large 'P' at the top right of this page! I hope you enjoyed Joannes Designs Week29. Just 23 patterns to go!